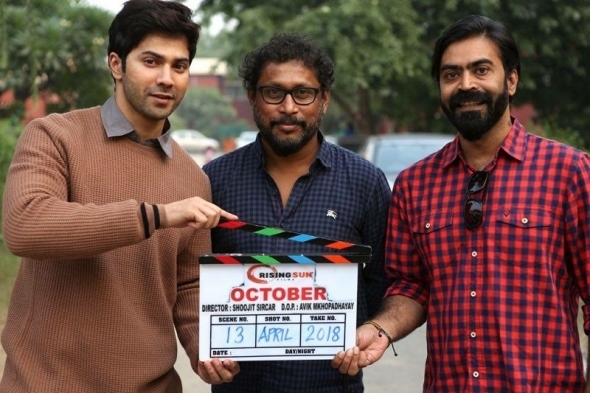 SHOOJIT SIRCAR is no ordinary Bollywood director and his film ‘October’ (released today) is a work of poignancy and depth. It may not always quite work (in film terms), but established Bollywood pin-up and golden boy, Varun Dhawan is very solid and believable, while newcomer Welsh student Banita Sandhu is harder to assess because her role is essentially one-dimensional, though not necessarily easy. She seems to have all the attributes and her role in this film won’t do her future prospects any harm. www.asianculturevulture.com was one of a handful of journalists to view the one hour forty-five minute film in the UK, a few days ahead of its worldwide release today. Sircar, the director behind the highly successful ‘Piku’ (which paired legend Amitabh Bachchan with A-lister Deepika Padukone as father and daughter respectively,) is not really part and parcel of the Indian movie industry that is Bollywood. He uses Bollywood stars, sure, but the films he puts them in are idiosyncratic and go against the grain of the mass preoccupations of the Indian film industry. Not for him are there masala moments, flashy item numbers or fantastical events – his films are rooted in the everyday and reprised by characters we see much in real life, but not so much on screen in Indian films. In conversation on the phone from Mumbai, he is very amicable and rather charming. Here’s an Indian director who wants to make intelligent, socially relevant films that have something to say to all of us. He was coy about the plot and while we don’t want to give it all away – it’s very believable and rightly, as he has always outlined from the outset, not a love story but a story about love (read the review for more on this). It is also inspired by his own personal experience, though at the time he said he didn’t want to reveal it, but would when the film was finally released. Indeed, Dhawan plays ‘Dan’ a aspiring hotel manager, training in one of those ubiquitous five-star Delhi establishments, alongside Sandhu (‘Shuili’ in the film) until a terrible event changes both their lives irrecoverably. On the surface, both Dan and Shuili are nothing unsual – it’s the circumstances of their ‘relationship’ that is and what is at the heart of this story. Sircar, who grew up in Kolkata but actually started a hotel career in Delhi puts us into a world we often seem from the outside – the film goes inside the world of hotel training with Dhawan playing a character who is not exactly in love with his chosen path; while Shuili appears conscientious and focused. It is again part of the tension of the unusual ‘coupling’. Sircar told www.asianculturevulture.com he wanted fresh faces and new talent and initially had never thought about Dhawan as the main man. Dhawan pulls it off and while we not sure it’s his forte as an actor, he shows he can play a complex character who is a little uncomfortable in his own skin (and nothing like the real Dhawan). But it was a challenge for him Sircar revealed. Sircar said he found an honesty and physicality about Sandhu that also worked very naturally. “I think she’s fantastic. Her eyes are very, very expressive and I needed somebody who could do less and express more…” he explained. He found her when he worked with her on a commercial in Mumbai. (Read our interview with ACV’s Tasha Mathur here). Sircar is one of the most interesting directors in India today. This is not a commercial film – it is a bold and brave theme and he deserves credit for taking it on. What does he want his audience to take away from the film, we asked. “There are a lot of human behaviours we do in everyday life to keep happy and there are some unconditional things that we do and we just don’t realise. Love is not just about gifts. Everyone tells me they want to take home my characters, whether it be Piku or Vicky Donor (from the film of the same title). I hope they are going to take home the characters from ‘October’. GITANJALI RAO as Shiuli’s mother is terrific and Sircar’s story, written by Juhi Chatuverdi, is a simple tale on one level – boy and girl work together, have an uneven friendship (if that) but something between them dwells and lingers and changes Dan, Dhawan’s character and brings them together. Well-shot and ably aided by some beautiful music, this is in many ways, one of the most melancholic films you will ever see come out of India. Sircar’s subtle and deft direction allows us to consider many things – not just the nature of love – but in several dimensions, and the pressures of family relationships and what illness can do. It most certainly is not for the masses but there’s something tender, complex and stirring about how Dan cares for Shiuli. Powerfully, Sircar leaves the character’s motivations vague and they are never fully explained or explored. Some won’t like that, but it makes you think.